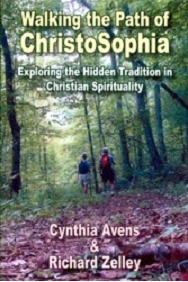 Our book Walking the Path of ChristoSophia: Exploring the Hidden Tradition in Christian Spirituality provides a wealth of background information about esoteric Christianity as well as practical applications of Christian spirituality for daily living. You may find out more about our book below. 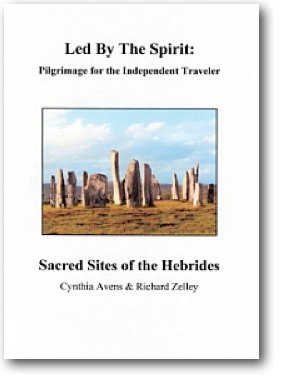 Our pilgrimage guidebooks, based on our own experiences of travel to sacred places, are designed to help you plan a pilgrimage that combines the convenience of the group tour with the freedom of the independent traveler. 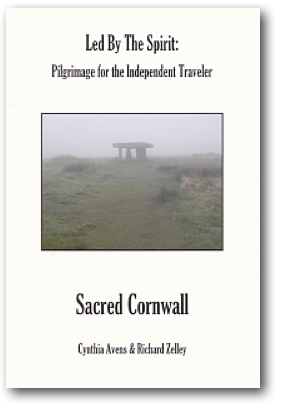 You may find out more about our pilgrimage guidebooks by clicking here. To most people the Christian church is like a busy interstate highway that provides efficient travel for large numbers of people to the City of God. However, there have always been a few hardy pilgrims who have struck out on the "spiritual bypaths" to seek the Divine in the hidden tradition of Christian spirituality. This exploration leads to the discovery of those elements that have been mostly missing from mainstream Christianity: the sacredness of the natural world, the feminine dimension of the Divine, and the value of mystical experience. Together these bypaths make up the Path of ChristoSophia, for the essential discovery is the Divine Feminine in union with the Divine Masculine. 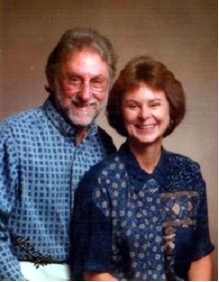 Cynthia Avens and Richard Zelley have explored the spiritual by-paths for many years as both scholars and practitioners. Cynthia has a Master's degree in Counseling Psychology and has been a college professor for over 25 years. Richard has a Master's degree in Musicology and a Master of Divinity degree. He has been a college professor for over 40 years and is an Easter Orthodox priest. In 1990 they founded the ChristoSophia Community for seekers to come together to explore the hidden tradition of Christian spirituality. "Walking the Path of ChristoSophia is an illuminating journey through the corridors of Western Spirituality revealing hidden aquifers of mysticism and feminine spirituality. These living waters irrigate the wasteland created by institutional denial of the feminine aspects of Divinity, healing the parched earth and tortured psyche of modern man." This book is like a spring of precious water that can nourish and sustain the reader over many years, even a lifetime. Lovingly wrought, it can be consulted again and again for its wisdom and insight. Working together, the authors have recovered for us vital elements of the Christian tradition that have been lost or excluded from mainstream teaching, to the great impoverishment of Christianity as a whole. At this crucial time of choice for humanity, their book reveals the way of the heart that could unify the visible and invisible dimensions of life, reconnecting nature with spirit, body with soul. The great spiritual task of our time as they see it, is to integrate the ancient wisdom that recognized divine immanence as the feminine face of God with the extraordinary scientific discoveries that point to our participation in the awesome Mystery at the heart of the cosmos. This marvelous book points the way for all who are concerned with peace, justice, and the survival of the planet. With power and grace, the authors demonstrate that the path of ChristoSophia balances the Divine Feminine and the Divine Masculine, thus restoring humankind and all creation. The authors' scholarship is impressive and their style is accessible, as they synthesize a wide variety of traditional and excluded sources. Cynthia Avens and Richard Zelley use the apt metaphor of "bypaths" for the hidden traditions within Christianity. 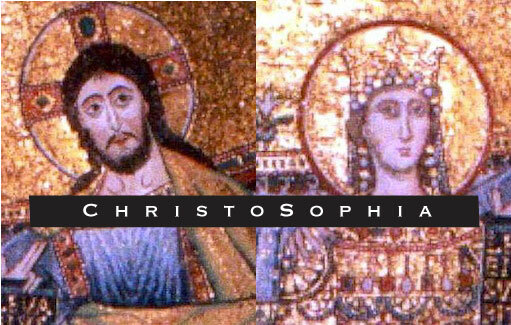 The creative symbol of ChristoSophia restores the Divine Feminine to her original prominent place in Christianity. The institutional Church suppressed Sophia; the authors show that it is imperative to rediscover her in the "bypaths" of the Christian tradition. This insightful book reveals ways that ChristoSophia resurrects the Divine Feminine, restores the natural world, and recovers the mystical Christian tradition. I highly recommend Walking the Path of ChristoSophia to people of all faiths who desire a deeper spiritual experience, equality and justice in human relationships, and the restoration of the earth. What a wonderful guide to greater spiritual fulfillment. In their scholarly but eminently readable book, Avens and Zelley explain the important role of women in early Christianity, focusing on the two Marys, and celebrate the significance of Sophia, the feminine aspect of the Divine. 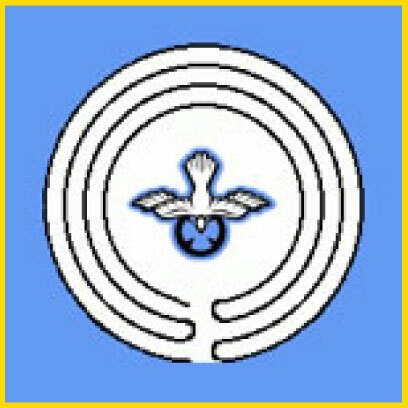 The authors also discuss the hidden revelations of lost scriptures, the role of Celtic Christianity, the history of the Holy Grail, the symbolism of the Green Man in nature, the mysteries of the Kabbalah and the rewards of walking a unique spiritual bypath...that of the ChristoSophia...which acknowledges the union of feminine and masculine divinity, the sacredness of nature and the rewards of mystical experience. The authors' genuine belief in the spiritual rewards of walking "the path with a heart" is likely to appeal to readers of all faiths, and perhaps even those who have lost their way along the spiritual highway. Much like Cynthia Avens, the co-author of this book, I have wanted to belong to a church. I wanted to commune with people who supported and embraced the tenets of Christianity in a loving, caring, and sharing manner. From a feminist perspective, I found that most church members are blinded by a patriarchal tradition and women are marginalized in the process. The authors of this book beautifully illuminate Christian spirituality in more inclusive ways that highlight the feminine side of Christ. I also am very close to nature and feel like I am in the presence of God when I am outside. I am a 'green woman.' The authors describe this type of seeing and appreciating God as a byway. Instead of taking the concrete highway (the experience of a traditional church), one can enjoy the less traveled, spiritual nature path to celebrate God in many incarnations, for example as feminine and in nature as the green man/woman. I highly recommend this book to all people who can appreciate exploring Christian spirituality in non-traditional ways. One of the most hopeful signs of the spirituality that is emerging in our current time is the renewed interest in pilgrimage. This desire to travel to sacred places seems to be a central feature of the spiritual makeup of human beings. Ancient peoples worshipped their gods and goddesses as they dwelt in the natural features of the landscape. Medieval Christians often performed arduous pilgrimages to holy sites to receive the blessings of a favored saint. And today, as most contemporary religions emphasize the mind rather than the body, many people are experiencing the archetypal yearning to once again practice the type of embodied spirituality that is found in pilgrimage. For more than 20 years we have been “pilgrims,” traveling to sacred places as an important part of our spiritual practice. Each pilgrimage has required extensive time and effort in research and planning. While there are many guided, group “pilgrimage tours” available today, many seekers prefer the freedom and solitude of independent travel but do not have the time or inclination to make the necessary preparations. We believe that we can perform a valuable service by sharing what we have learned from our pilgrimage experiences with you, and have developed a series of pilgrimage guidebooks that enable you to combine the convenience of the planned group tour with the freedom of the independent traveler. All that you have to do is make your travel and accommodation arrangements – the rest of the planning we have done for you! Please help support this website by ordering directly from us! You can order with credit card through PayPal. Payment is $16.95 per book plus shipping and handling. Books ordered through PayPal will be shipped within 3-5 days. How to Order: You can also order by sending a check or money order made out to Richard Zelley in the amount of $20.90 for each book (includes shipping and handling) to: Richard Zelley, P.O. Box 611, Morganton, Georgia 30560. Orders by check or money order will be shipped within 2-3 weeks. Books ordered through PayPal will be shipped within 3-5 days. 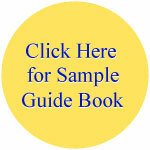 Guidebooks may only be purchased through this website. The cost of each guidebook is $6.95 plus $3.95 for shipping and handling. Credit card orders through PayPal will be shipped within 3-5 days. We have planned each pilgrimage so that it should fit comfortably into a two-week schedule. You can adjust the itinerary to suit your own needs, depending upon the time that you have available. All of the sites with descriptions in the guidebook are ones that we have visited and found to be especially interesting or significant. 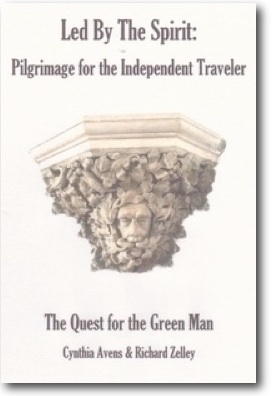 Explore the fascinating, enigmatic "Green Man" as he appears in small country churches as well as great cathedrals in Britain. The sites were chosen so that you can see some of the most significant and diverse examples of Green Men without having to travel great distances. The areas you will be visiting on your quest – Wiltshire, Somerset, Gloucestershire, Herefordshire, Devon in England, and southern Wales – also contain some of the most beautiful countryside in Britain. Explore the major places in Britain that evoke the magic of this great mythic hero. 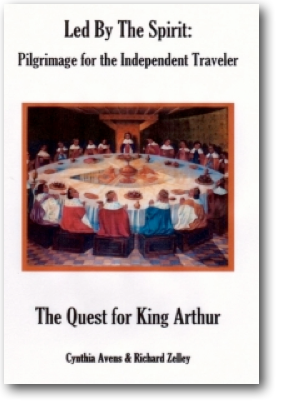 This pilgrimage will take you to three areas that are most significant in the quest for King Arthur: Cornwall and Somerset in England, and Snowdonia in Wales. These locations contain many of the most famous Arthurian sites that have both mythological and historical associations. In addition, your journey will allow you to experience a variety of beautiful British landscapes, including mountains, moors, and sea. Explore the sacred treasures of this unique landscape that exists in the remote corner of southwestern England. Cornwall is an elemental land of rocks and moors, woodlands, and sea cliffs which still retains the myth and magic of its Celtic heritage. Your pilgrimage will take you to numerous and varied sacred sites that are in close proximity -- impressive standing stones, stone circles, quoits, fogous, and holy wells , especially in the fascinating Bodmin Moor and magical West Penwith areas. Explore this group of islands off the western coast of Scotland that contains an abundance of both pagan and early Christian sacred sites. Your pilgrimage will take you to some of the best examples of megalithic structures in all of Britain, including the awe-inspiring Calanais (Callanish) Stone Circle, as well as Celtic crosses and chapels that mark these islands as a center of Celtic Christianity. You will travel by ferry to the Isles of Bute, Islay, Colonsay/Oransay, Mull, Iona, Skye, Harris and Lewis, where the wild and unique beauty of each will provide the sacred landscape for your pilgrimage.